I hope you are all doing well. I'm actually feeling pretty lousy today and came home early. I was able to get a half day sub for my class. I'm really hoping to feel better tomorrow. I think this incessant pollen finally got to me. Anywho, I figured I might as well put up a blog post while I'm being lazy. If you saw my post earlier this week, you may remember this adorable little vanity tray I picked up while thrifting Saturday. The gold finish was beyond help so I decided to give it a coat of paint. I went with white which is my favorite lately. I love how it turned out! I placed it on my vanity in my bedroom. It was the perfect home for this adorable little mercury glass vase with a silk rose. I picked this up a few weeks ago at TJ Maxx for $3.99 I believe. The love sentiment was a Target Dollar spot item. I believe it was $3. So...$9 for this sweet little vignette that makes me happy. Here is my vanity...a little cluttered I know. When we remodel our bedroom, we are going to build some shelves to house some of the books I keep in my room. Most of my Bibles, devotional, self help, and school related reads are kept in here, along with my Kindle. This is just a few of them. I have BIG plans for our small master bedroom redo and can't wait to get started on it. Isn't this little compact sweet? My mother in law gave it to me for Christmas along with a couple other things. She knows I love turtles and has given me a few turtle themed items over the years. This one is so pretty! I know this was a short post. Hopefully I will have more to share soon. I need to go finish supper...chicken Caesar salad. I hope you have a wonderful Friday and weekend. Hello there and welcome back to Willie Mae Lane. Today I am sharing some of my finds from the weekend. Saturday, I went shopping with my mama, sister, and aunt. We only went to one thrift store, but I had not been in this one for a while since I haven't been thrifting as much as I used to. I found some really good stuff to bring home. First up are a few books. I can't go into a store without looking at the books. I found a few I think will be good reads. Hard covers were $1.29 each and the paperback was either $0.99 or $0.79...I really don't remember. I found these album accents. I have never seen anything like these before. 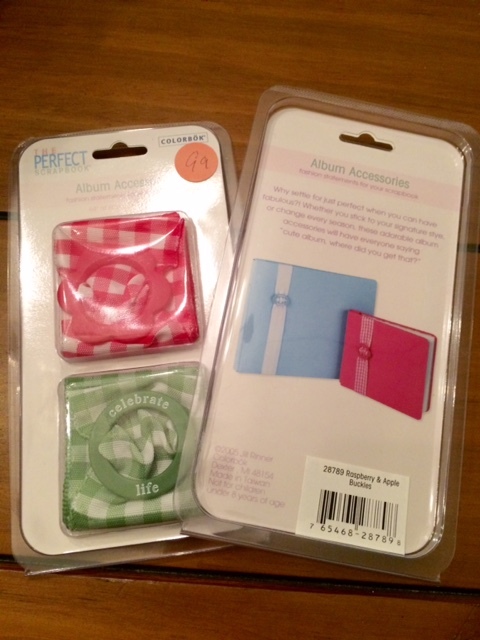 I most likely won't use them for their intended purpose but the ribbon was pretty and brand new so I bought both packs. They were $0.99 each. Clothing was half price..I found this long sleeve camo shirt for my son. He's the hunter of the family, so I thought he could use this. It ended up being $2.50. I bought this one for me. It's Caribbean Joe brand which is an expensive brand. The colors are so bright and cheery...perfect for spring and summer. 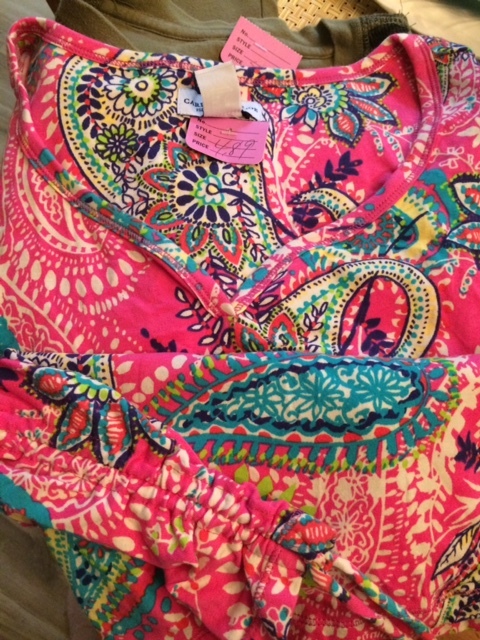 The pattern and colors remind me of Lilly Pulitzer. 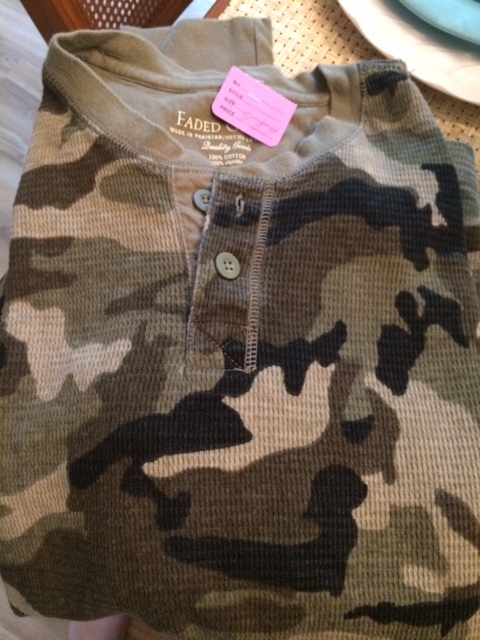 The tag was still on it...looks like the original price was $49.99! No way I would ever pay that for this shirt but for $2.50, it came home with me. I love the 3/4 sleeves, v neck, and the side drawstrings at the hem. Now I just need some new white capris! 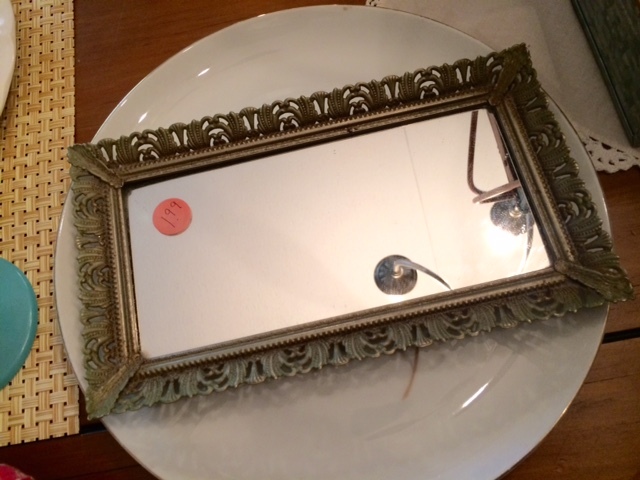 I fell in love with this little mirrored vanity tray. I have several of these but have never seen such a small one. It is sitting on a dinner plate. It will be getting a paint job soon. It was $1.99. 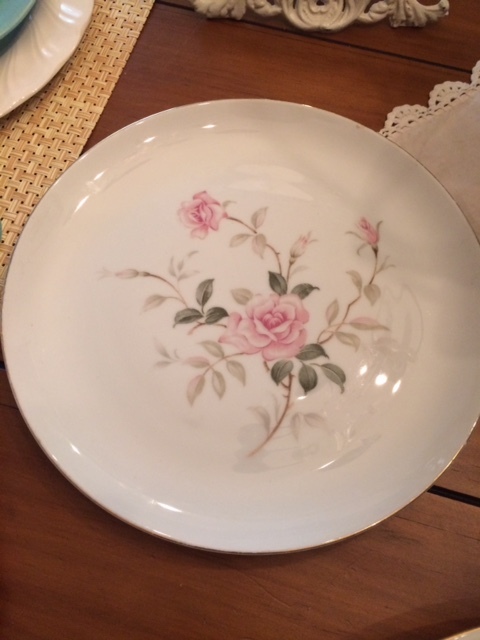 I picked up this pretty dinner plate to add to the mismatched china collection I started to use for parties and special occasions. I think it was $0.99. 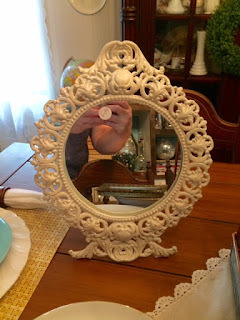 This cast iron vanity mirror came home with me as well. It was the most expensive thing I bought at $6.99. but it is a very heavy, ornate piece. I think it is probably old as well. It appears to be. It may get a fresh new coat of white but I'm not sure yet. It's about 12 inches tall. I plan to use it in my bedroom after we finish remodeling. This pretty little strawberry relish tray also came home with me. I just couldn't resist! It was $2.99. That's it for thrift store finds. After we left the thrift store, we went to lunch and then to Wal Mart. Wal Mart has really stepped up their home decor game. I found this adorable silk arrangement in a white wooden box for Just under $5. It is so pretty and springy! I also picked up this 4 piece serving caddy by Better Homes & Gardens for $10. It can be used for so many things. I'm sure it will serve many purposes over the years. I also picked up some new dishcloths. 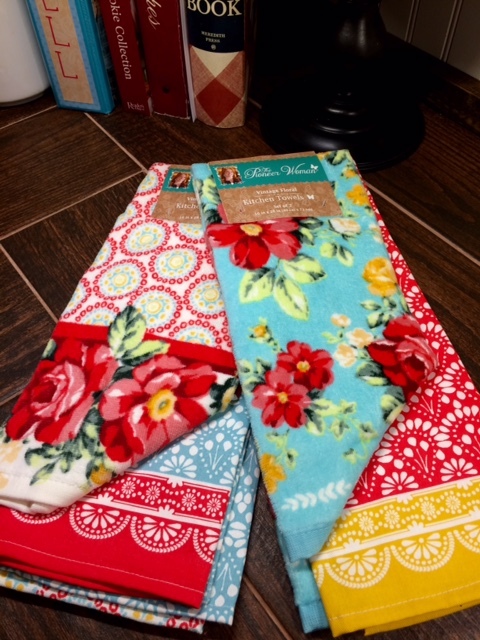 These by the Pioneer Woman are so bright and colorful. I just love them! They were around $5 per set. 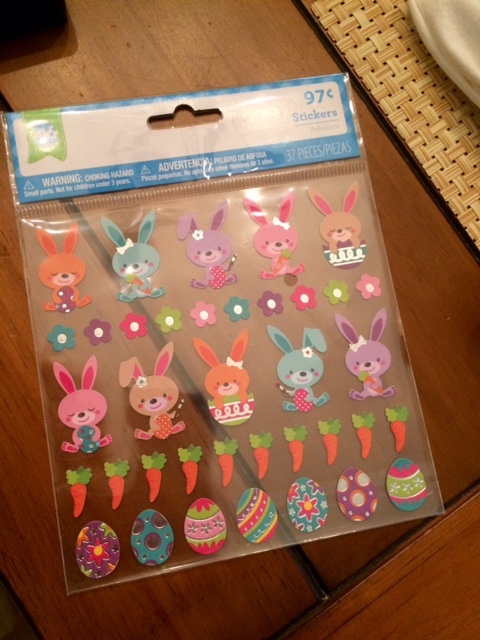 I also picked up some adorable Easter stickers to use in my planner for $0.97. We had a fun day out and about! When we got home, I had to rush to unload my groceries and put things away so I could get to the race track to watch my son race. When I opened my car door, I had a package in the seat from Amazon that my hubby had laid inside. It contained this waist bag with an attached water bottle holder. I have been needing something like this when I go walking. The zipper pouches will hold my cell phone, chapstick, and anything else I might want to take with me. I mainly wanted it for the water bottle pouch. The one I have now hangs over the shoulder and it bothers me when I walk. This will be so handy! It was only around $10. I'm sure it will get lots of use! As for the races....Dakota was doing well, but his car ran hot and he didn't get to finish the race. It was an exciting night with several wrecks. One car came up off the track and turned around mid-air and landed in the barrier fence up off the ground. It was so scary! The driver was not hurt at all...thank the good Lord. It was one of the really fast cars...my son doesn't drive one of those. I don't think I could handle it. Anywho, I hope you are doing well and have a lovely week. I can't believe it went so fast! Hello friends! I am so happy to have you drop by to visit. 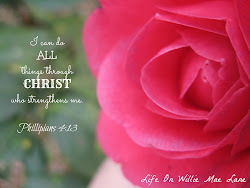 I trust you had a lovely weekend and are preparing for a new week ahead. 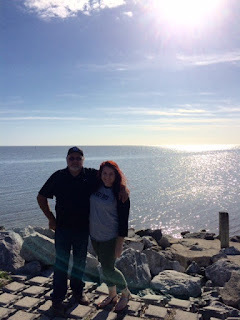 Today I wanted to share a few photos taken Friday evening in a tiny neighboring town on the Gulf of Mexico named Horseshoe. There isn't much in this tiny town except homes, a post office, a couple small grocery/bait and tackle stores, & a campground. There have been a few restaurants come and go over the years. The big storm we had last year destroyed the restaurant that was there. I'm not entirely sure if there is another one now or not. We went to a dinner thrown by a few of my mother-in-law's friends to celebrate her finishing her cancer treatments. Such a blessing! Before we went to the dinner, we rode down to the point to snap a few photos. Like I said, there isn't much to do here but if you want some downtime and peace and quiet, this is the place for you. It is a lovely little tiny town. I had a long, somewhat stressful week last week and wasn't feeling very well for much of it, so this peaceful evening was just what I needed. Here I am with my handsome hubby...I love this man so much. He truly is my best friend! Miranda was able to come meet us and go to the dinner with us since she got off work early that day. Dakota wasn't able to attend but he had just went to visit his grandma a couple days prior. We had an absolutely delicious dinner. I wish I had snapped a picture. I can't believe I didn't remember to do that. You could have seen a true southern dinner. 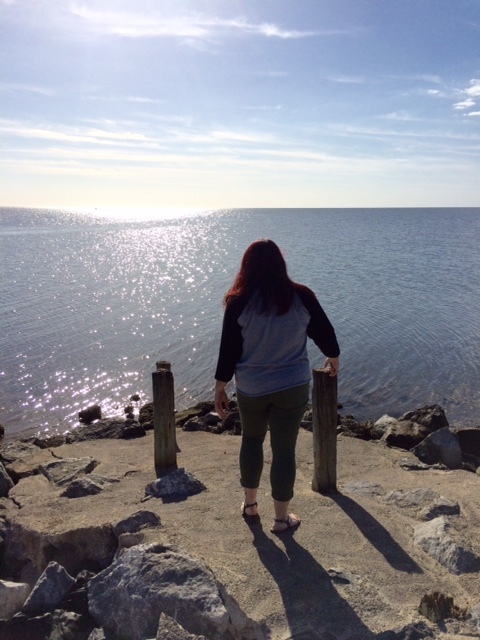 After we ate, the hubby, Miranda, Joyce (my MIL), and I walked down to the boat ramp to watch the sunset. Of course, it was obstructed by a cloud, but beautiful none the less. This pretty little wildflower caught my eye. There are some gorgeous homes in Horseshoe. And, if you are willing to drop a million or two, you can own one yourself. Oh how I wish...lol! I would settle for a tiny lot to park an RV on. One of the homes for sale looks like a ship. I didn't notice it in time to take a picture but I will go back someday and take one when I do. It's not white sandy beaches like you might expect, but there is a beach area a few miles away. People who enjoy fishing and kayaking or just a slow pace of life live in or visit Horseshoe. Many of the residents have lived there for their entire lives. One of my dad's sisters and her husband own an island not too far from here. I have never been to it, but how cool...imagine owning your own island! Here's grandma being silly! Miranda was her first grandchild...she was the first on both sides actually. And, she was the only one Joyce had until I had Dakota nearly six years later. She loves her grandbabies so very much...even though they aren't babies anymore. She has been an amazing grandma to my children and second mom to me. She is a sweet spirited lady with a positive outlook who enjoys life so much. Thank you all who have kept her in your thoguhts and prayers. We have three long months to wait before we know if the treatments did their job. I have faith that they did. Thank you so much for visiting Horseshoe with us. Hello friends! Welcome back to Willie Mae Lane. I am so glad I have gotten back to blogging. I missed it so much but maybe the break was what I needed. Anywho, I just got home from my first day back to work after my spring break. It was a very good day...Mondays usually are though. I think attitude determines how your day will flow so I try to start each one with a positive attitude. Today I want to share my weekend with you. Saturday began with my 8:00 AM workout. After that, I dashed home to shower and get ready to head to Gainesville. When I posted last, I mentioned that I was going to see Beauty and the Beast on Saturday with some of my family. I picked up my sister Nancy and my Aunt Loretta and we headed to Gainesville to meet my daughter Miranda and my sister's girls, Shelby and Taylor. They all live there. We met at Square 1, which is a great place to eat. They have wonderful, unique burgers which is what I usually get, but this time I tried something different. I had the Aloha Chicken sandwich and sweet potato fries. The sandwich was a grilled ground chicken patty with applewood smoked bacon, grilled pineapple, and a terryaki & ginger sauce on it. Oh my was it delicious! 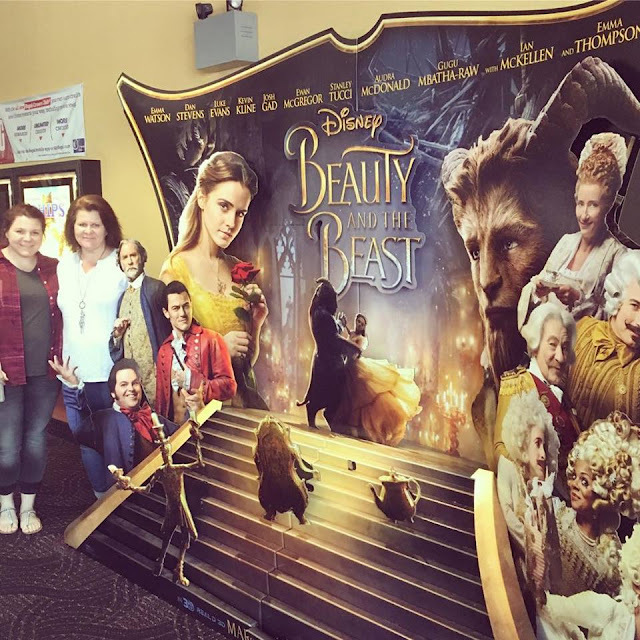 After lunch, we went to see Beauty and the Beast. I had pre-ordered our tickets because we didn't want to risk not getting them. The movie was outstanding! It is my favorite Disney movie of all time and I didn't think they could do anything to improve it, but they did. They added some parts that gave a little more history of both Belle and the Beasts lives. It was so very good and I will definitely purchase this one when it is released. 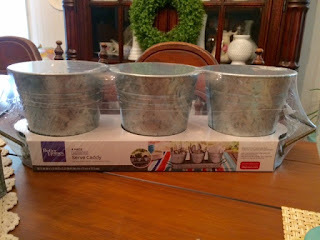 I picked up an order from Pier 1 while I was in Gainesville. I had to put my blinders on when I went in the store because they had all their spring decor out and oh my...everything was so gorgeous! I loved this sweet place setting! I went in for this though! I had mentioned here a couple months ago that I really wanted this tiered tray for my coffee cart but I thought it would be too big. Well, I decided I just had to have it so I ordered it online while there was a 15% off sale going on and just picked it up in the store. I do not regret my decision to purchase this piece. This piece is so versatile and can be used for many things over the years. I LOVE it! Galvanized and copper...does it get any better? Here it is styled for spring. After I got home Saturday evening, the hubby and I went to visit his mom and her boyfriend. She is doing very well with her treatments. She is finished with chemo and will finish radiation this week. She has tolerated the treatments so well. The only issue she had was a blood clot where her port was placed so they removed it. She hasn't lost her hair yet either and the doctors told her she probably won't at this point. She will have to wait three months for another scan to see if the treatments worked and I'm sure waiting won't be easy. Thank you for your thoughts and prayers. They mean so much! 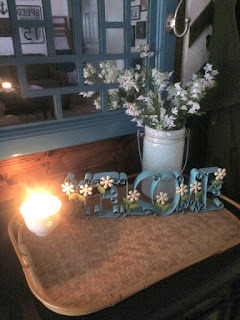 Sunday I piddled around the house finishing little projects, tweaking my decor and so on. I was itching to paint something else with the milk glass paint I purchased last week. This lamp was already painted white, but as you can see in the picture, it was quite dingy. The paint had a flat finish and dust was hard to get off. So, I sprayed it with the milk glass paint and it is so pretty now! It will be easier to clean now as well. I added one of my old ladders to the end of the sofa to hold blankets. I am enjoying this addition to the living room. I also moved the tulips from the dining table to the coffee table. They look so pretty..... I wish I could keep fresh tulips here all the time! 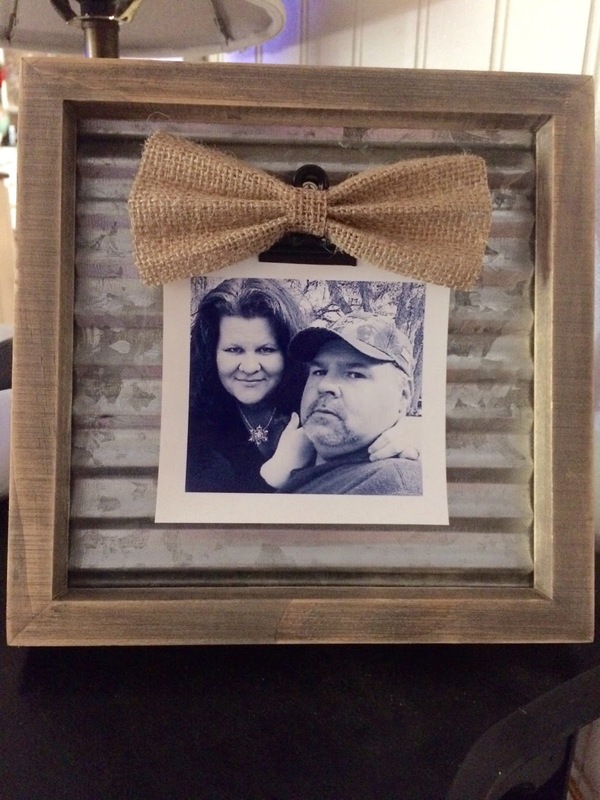 I purchased this adorable frame at Hobby Lobby a few weeks ago and printed a picture of the hubby and I to clip in it for now. This is an old picture but one of my favorites. 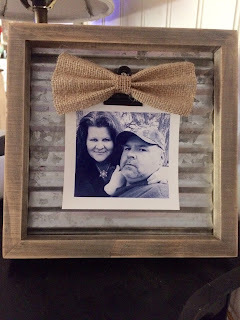 I purchased this piece at Hobby Lobby after the movie on Saturday to put in the new tiered tray from Pier 1. I decided to paint it since it was the same color as the tray. So, I used the new jade paint I purchased at the same time as the milk glass paint. It looks so pretty. I also picked up the sweet little white egg at Hobby Lobby. The hubby and I had an awful craving for some warm home baked cookies, so I whipped up a batch. I hardly ever bake anymore since we are eating healthier most of the time. Every now and then though, you have to have a really good treat. I was craving chocolate chip cookies but had none on hand, so I improvised. I had some Wilton Candy Melts left over in the freezer from Christmas. I substituted the buttered toffee flavored ones for chocolate chips in my favorite chocolate chip cookie recipe. I also added chopped pecans to half the batch and oh my, were they delicious! I think they were better than chocolate chip! We both love chewy cookies and these fit the bill! Here's the hubby's plate with his milk. I'm not a milk drinker! I still have some of the candy melts in the freezer as well as some salted caramel ones for when we get a craving again. I picked this little box up at Harbor Freight on Friday when the hubby and I went to town. I wanted it for an organization project in my craft room. 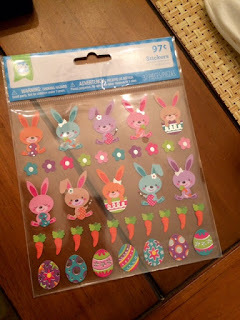 I have been picking up sequins in the Target Dollar Spot each season when they get new colors. The containers they come in will not stay together after you pull the tape off, so I thought these little boxes would be perfect to store them in. Lots of room to grow! There are 24 boxes and I only filled 9 of them. I labeled the box with my handy dandy label maker...still one of my favorite thrifting finds of all time! I enjoyed my spring break so much. I didn't do much away from home, but it was nice to have the time off from the stress of work. Teaching is fun and rewarding in many ways, but we teachers have an incredible amount of stress on us too. So much is expected of us and our students and when you teach in a high poverty area like I do, the stress is even greater. I do love my job and am not complaining, but these breaks help me get through the year. This school year is fast coming to an end...I can't believe we only have about 10 weeks of school left! I hope you all have a lovely week. I hope to keep posting on a fairly regular basis so I will see you again soon!